Let me begin by saying that I don't believe the boat on this postcard was a gondola, and for that matter, I'm not so sure it was marketed as one either. I discovered it on e-bay about ten years ago because the seller had listed it as a postcard with a gondola. There are some things about the boat that echo back to the gondola, such as the size and shape of the hull, and the straw hat worn by the "gondolier" on board, but then lots of men wore such hats back then. The fact that the boat is red carries little meaning because many gondolas brought over between the 1890's and the 1930's ended up being repainted - often red, white, green, or tan. What really convinces me that we are not looking at a gondola, is the absence of any decks. A child is sitting where there should be a bow deck, and the positioning of the gentleman at the stern serves as a clear indication that no "poppa" deck exists. 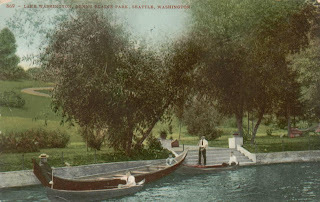 The postcard is postmarked with the words "WORLD'S FAIR SEATTLE 1909", and the text on the front of the card tells us that the image came from Lake Washington in Seattle. My theory on the boat is that it was either a very "creative" take on the gondola, or that it was actually a boat from one of the native tribes in the Pacific Northwest. This is a fun one in that it's such a mystery. Got any theories of your own?